1) We're buying organic produce, which is way more expensive than non-organic. 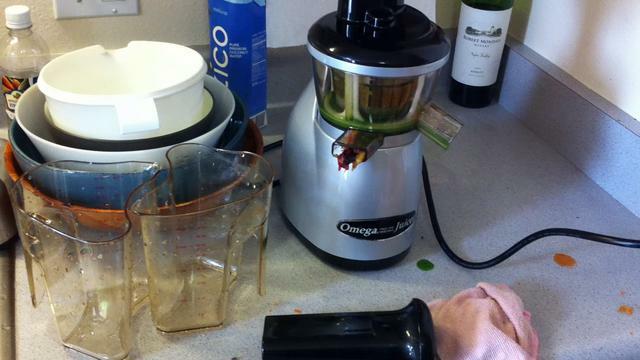 And this juicer didn't extract all of the juice from the items it was juicing, leaving very wet pulp. This meant that although the juicer itself was cheaper, we weren't getting as efficient a juice from it. 2) The larger issue, however, is that there's a lot of literature about the advantages of low-speed (80 RPM vs. 3600 RPM) juicers, called "masticating" juicers. While the high speed juicers (like the Jack Lalanne) use centrifugal force to extract the juice from a spinning filter, the low speed masticating juicers "chew" the juice out of the food. You can find plenty of claims on the web about how low speed juicers "preserve enzymes" in the food and "don't cause oxidation" and "preserve nutrition" in the juice. The instruction manual for one of the Omega juicers below even went so far as to say that juice from low speed juicers doesn't lose any of its goodness for up to 72 hours, while juice from high speed juicers has to be consumed within 20 minutes. I don't know that I specifically buy any of those claims, but I will say that reason #1 was enough for me -- I want to extract as much juice out of the fruits and vegetables as possible from this pricey organic produce. So, although the Jack Lalanne juicer has a lot of great qualities to it, we were off in the hunt for a low-speed juicer. 1) Fibrous vegetables (think: leafy greens) that are stringy get completely clogged up in the juicer because of its design, so you end up having to chop these items up into chunks that aren't more than 2 or 3 inches long to keep it from clogging. 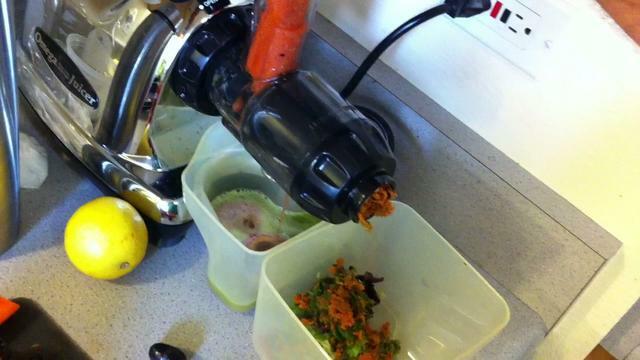 2) An even bigger problem is that this juicer choked on carrots. 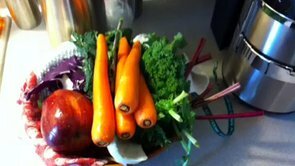 How can a juicer choke on carrots?! Especially when there's a carrot in the stock photo?! It wouldn't happen every time, but it happened often enough that it proved very annoying. A carrot would cause the juicer to grind to a halt, then we'd have to reverse the juicer, pull the carrot out, chop it up more finely, and repeat the process. Clean-up was also not as easy as I'd hoped -- while maybe not worse than the Jack Lalanne, definitely not any better. So, back to Amazon it went. The Omega J8006 Masticating Juicer: This is our current juicer, and the one I would recommend. Don't get me wrong -- there are trade offs. While it definitely produces the driest pulp by far, and while it may be the fastest & simplest in post-juicing clean-up time, it's by far the slowest in terms of the actual juicing time itself. Additionally, it has an amazingly small chute, meaning everything has to be chopped up. If the Vert 350 above had a smaller chute would it also have escaped the carrot problem? Quite possibly. But the J8006 is a solid beast of a machine. While the Vert felt like it was just barely able to handle the food we'd throw at it, the J8006 has no such problems, chewing up everything we've given it with ease. It's a confidence-inspiring juicer. The solidness of the machine plus the dry pulp has meant we've kept it and are pretty happy with it. If a juicer came along that could match its qualities but have a larger food chute, I'd definitely appreciate not having to cut everything up (example: the Jack Lalanne could handle an entire small apple through its chute, or if a big apple, cut in half. With the Omega, we have to cut the apple into 8ths). However, the fast and much simpler cleanup time and process helps offset the longer and more tedious juicing experience. 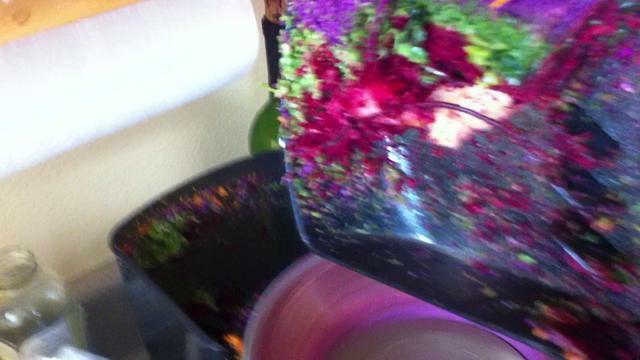 And for what it's worth, the juicer makes a really satisfying "crunch" as it chews through food. I know, kinda meaningless but fun just the same. Good luck in your juicing quest, and I'd love to know what you think, and what experiences you've had in the comments below. Excellent work. My wife and I are new to the world of juicing. The J8006 caught my eye because it was stainless steel and my wife is also on a blck granite and stainless steel kick at home!!! So I figured I could knock out two birds with one stone. However the price is steep. So then I thought what if it's not as good as it says it is?? $300+ out the door so I was going to do what you did....luckily I came across your dudiligence!! I am going to go with my initial instinct and order the J8006... Thank you for the advice!!! Thanks, you can check this http://21streviews.com/jack-lalanne-juicer/ written by me. Good information knowing which juicer to purchase can be confusing. Finding a good juicer is so much easier now thanks to the internet. I've had my Omega juicer for about a year now. Heavy or not when I travel it comes with me. I'm only juicing so it's a must have :). Yes the shoot is small but I have four kids ages 10-16 and there is no part of this machine, running or taken apart for cleanup, that could harm them. To those considering less expensive juice extractors you'll pay for it as soon as you realize there's more waste than juice (my experience with the Jack L juicer) On a scale of 1-5 this juicer is a 10! Passionate about helping others transform themselves, mind, body, and spirit from ordinary to extraordinary! 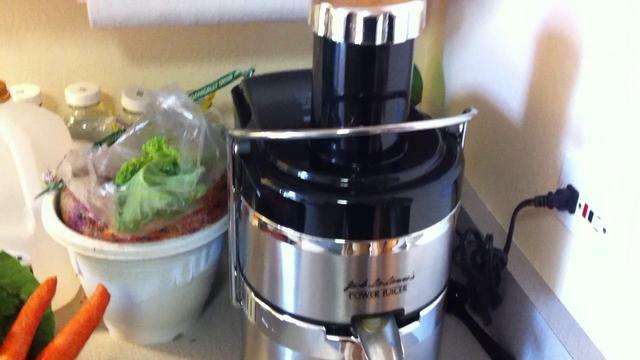 My wife and I have been juicing for some time now and were given the Jack Lalanne juicer but are also looking to get a higher quality machine that will extract more juice form the pulp. We have had great luck with what we have but like you, I want to most out of my organic produce. I love juicing and raw food! I used to use a Champion juicer when I lived in one place, which was solidly built and produced dry pulp. It could handle all the fruit and veg I threw at it. Though I would use easier veg such as carrots to push down things like ginger and garlic and greens. The chute was about an inch so I did have to cut up apples, onions, broccoli and larger carrots and celery. Clean up wasn't too bad - I just did in the sink. Yes indeed, those things are heavy! Way too much to lug around. Thanks for the perspective! This was amazingly helpful. Thank you! You bet! Let me know how it goes. Thanks! I've been having a hard time choosing between the VRT and the 8004/6. This was the first time I saw a video where the user wasn't fighting with the latter. If you have some patience, and especially if you can juice every second day, there's a clear winner! Hi Daniel. This post has helped me make the decision about getting the Omega J8006 Juicer! I really love using this product. I agree with you assessment about the solidness of the machine. It's definitely heavy, but it stays on my countertop, so that doesn't matter much to me. Like you said, the pulp is dry and the amount of and quality of the juice that is extracted is impressive. The only food I have trouble with is pineapple. Perhaps because pineapple is very juicy, it kind of slushes around in the masticating screw instead of extracting the juice. Has anyone else had this problem? Other than that, the J8006 is amazing in its ability to chew up just about anything else I put in there including leafy greens. It is very easy to clean. I usually throw everything in the dishwasher, but the pieces are very easy to clean by hand as well. It's not too noisy. I was expecting it to be louder than it was. I agree that the chute is very small. That is the only thing that puts a damper on my juicing experience. 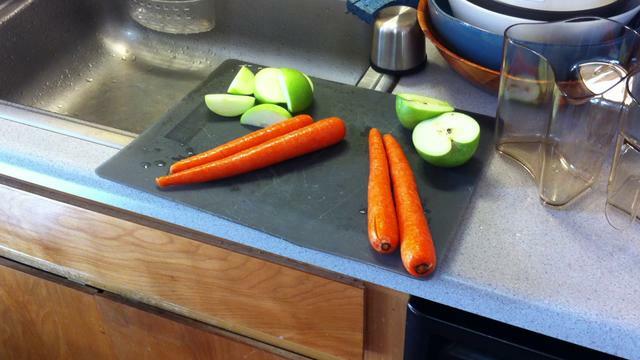 For me, the juicing time is long not because of the actual juicing, but because of the prep work. Food needs to be cut up into small pieces to fit into the chute. I was also impressed that this product can make nut butters, baby food, grind coffee beans, and extrudes pasta. I haven't used any of those features yet though. I would definitely recommend this product. Thanks for your review! Latonya, thanks for the details; glad you're enjoying it. Do you still use the Omega 8006? I saw this post is 2 years old now. I was thinking of getting one, is it still working for you? yes it works great and we love it!! Awesome Jeff! Ours is still working too (we bought it 2 years ago). I think the 8006 machine is indestructable. This post has nothing to do with jazz, I'm just a sucker for alliteration. It does, however, have everything to do with juicing. We're currently borrowing a juicer from a co-worker so if we don't like it and don't want to stick with it we aren't out a couple hundred bucks. Aside from not wanting to be a lame sidekick, we are also interested in the nutritional benefits. It's a quick easy way to take care of a couple servings of fruits and vegetables. Something we're both not very good at. Plus I watched "Fat, Sick, and Nearly Dead" and it scared me straight.